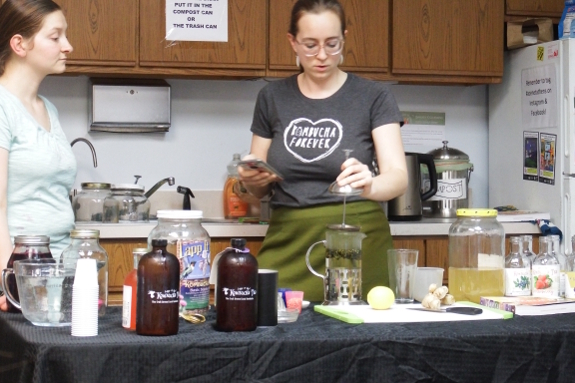 While I wasn't a huge fan of the kvas at Tuesday's workshop, the kombucha was definitely tastier. And no wonder since the teachers make the fermented sweet tea professionally to sell at several local establishments. I've actually steered clear of kombucha in the past for two reasons --- sugar and caffeine. If you're a soda drinker already, kombucha is a healthier alternative. But the happy gut critters didn't seem like a good enough reason to let the less healthy chemicals that come with them into my life. So I was happy to learn that you can actually make a caffeine-free kombucha using rooibos (aka African redbush) tea. The sugar, I'm afraid, is still mandatory. My other big takeaway from the class is that kombucha doesn't have to taste bad for ferment-o-phobes like me. 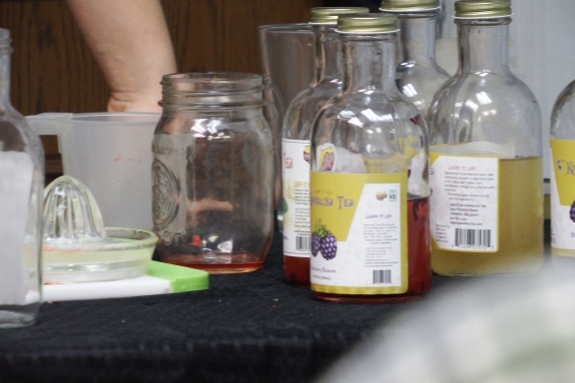 The teachers passed out several samples, all made by fermenting kombucha normally then adding in fruit or herbs before sealing the bottle for two to three additional days. Mark was a big fan of the jasmine green tea with concord grapes, which I thought tasted a little like red wine. I, on the other hand, enjoyed the lemon ginger, which tasted like a high-class lemonaid. Will we be making our own kombucha? The jury's still out. But we might try buying a bottle now and then at the farmer's market while making up our minds. Hey can you use honey instead of sugar? I often mix kombucha 50/50 with juice or tea, or put some in my smoothies. My husband has some GI issues due to the wide variety of medications he has to take. He doesn't like yogurt or lacto-fermented pickles for the most part, and drinking kombucha regularly has made a huge positive change in his GI situation. It took us a while to find a brand and some flavors we liked - there's definitely a wide variety of both! The source of this information I am about to give you is old second hand from the far reaches of my brain, but I'd swear by it. When I first started drinking Kombucha I was trying to overcome a soda addiction. My friends said drink Kombucha, and I was hesitant because it is made of sugar and caffeinated drinks, since I hadn't heard of the other tea kind. I know that I am no longer a sugar addict. I don't drink canned sodas anymore, or bottled sodas, that is. But I drink kombucha, and it doesn't make me crave sugar. Usually eating sugar makes me want more sugar and extra food soon too! Kombucha becomes transformed chemically in fermentation. I am sure of it tho not a scientist. Also, to answer Jane, honey is not possible for making it. I forget why tho. Jayne, honey isn't recommended, because it has antibacterial properties, which can hinder the growth of the kombucha bacteria. The sugar is converted into something which is easily digested, due to the fermentation process. So you're not eating straight sugar. It's there to feed the yeast, and once fermented, it converts the sugar to something your body can recognise. As a second ferment, we add to the kombucha bottles, dried sultantas, an apricot, two peels of a rind of lime (or lemon, if that's all you have) and a few slices of ginger root. When I'm out of fresh ginger, I make a ginger syrup, using ground ginger - about 1/4 cup added to the bottle, before the second fermentation. And because I don't like strong drinks, when it's chilled, I pour about a 3rd of kombucha in a glass, and top the rest up with water. So I get a bit of fizz, a bit of flavour, and a healthy dose of hydration. Not sure what happened to my other comment. But anyway if you decide to give kombucha a try I have scobys since I brew my own. I prefer to make it with green tea instead of black tea but my favorite is a blend of green tea and chaga mushroom. I also use a raisin kombucha as hair rinse instead of conditioner. And to answer Jaynes question yes you can use honey instead of sugar and if you use green tea with honey it is then called Jun which is a favorite of mine. Just to further what JenW said, don't use honey in a kombucha mother, as it will gradually reduce it's capacity to ferment. A Jun mother, is different to a kombucha mother. If you want to make Jun, source the correct mother, or you may end up killing your kombucha mother, feeding it honey. Then you'll think you failed at fermentation. Jun can be fed honey, because that's how the scoby was been raised. But it's advised a kombucha mother only be fed sugar, if you want it to continue performing well. If you have an oversupply of kombucha scoby, feel free to experiment with honey to see your own results. But I wouldn't compromise your only kombucha scoby, to honey. Chris is correct. I failed to mention that you would need a different mother for Jun. You can train a Kombucha scoby to become a Jun Scoby but it takes time and patience and really isn't worth the effort to do so. You're better off to acquire a Jun scoby instead.